The ‘everyday object’ has steadily held its place in art history’s media portfolio from the twentieth century onward. Everydayness in the dialogue on materiality has evolved since the impact of Marcel Duchamp and the Dada movement in which Teresa Aversa’s work finds its lineage. The space she explores in I Gave You the Best Years of my Life considers seemingly trivial instances of creativity in the banal. The bulletin board as canvas poses a challenge that echoes the history of the readymade in its evident reference to mass production, but also corporate quotidian settings and the associated environmental issues. 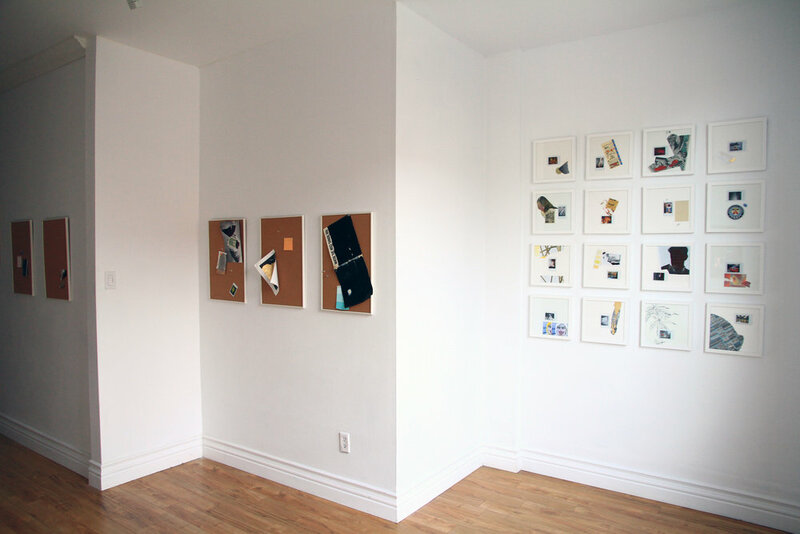 The bulletin board acts as a deceptive mechanism: it is easily dismissed in a room filled with its replicas, much like it would be in its corporate context, and certainly in a gallery. However, pinned to Aversa’s boards are nuanced meditations on the information and ephemera that circulate daily and the ways in which they are interpreted on an individual basis. Aversa’s process of pinning is intuitive, echoing the act of ‘curating’ one’s own bulletin board as a mode of escapism and expression. At times she juxtaposes items to create socio-political undercurrents, such as the fragment of a Martin Luther King Jr. poster pinned with a U.S. dollar bill. Along with found objects such as notes, wrappers and receipts, the artist also quietly inserts her own works onto the boards, disclosing her shrewd knowledge of media. Pages ripped out of magazines are painted over with gold leaf, drawings are interspersed with Polaroids from her archive. Relationships between the aforementioned elements speak to Aversa’s larger practice, which takes the focus off singular objects and considers the ever-changing dialogues between ourselves and material culture.